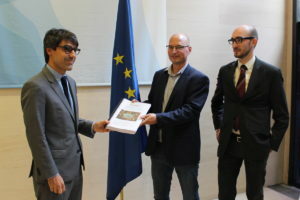 On 19 October 2018 I took part in a meeting with the Eurogroup in order to handout a petition signed by 117,000 European citizens demanding that the Eurozone governments fully reimburse the amount of profits they made out of the European Central Bank bond purchasing programme (SMP) which was activated in 2010. This is an issue close to my heart since I was already following this particuliar story 8 years ago when I was covering the Greek crisis as a journalist. Since then it took me lot of work to uncover that many more profits were done than most people aware about this issue think. As the article below demonstrates, Eurozone governments are likely to have made more than 17 billion euros of profits from greek debt during the crisis. Although the Eurogroup agreed to refund some of the profits to Greece, a substantial amount (8 billions) are missing from the deal. This is why we are demanding that the Eurogroup reviews its agreement and fully reimburse Greece. During our meeting, the Eurogroup spokesperson acknowledged that money was missing from the Eurogroup deal. He also committed to make the amount of profits more transparent, which is a good thing for further public debate. He also agreed to present the issue to Mario Centeno, the president of the Eurogroup. Unfortunately I take away from the meeting that it seems unlikely that EU finance ministers will re-open this dossier in order to meet our demands. We would need to heat up the pressure quite a bit to win this. You can support our further action by signing the petition here. For more details, see the article below which I wrote for Positive Money Europe. Through its peculiar “Securities Market Programme”, the European Central Bank generated billions of profits for creditor Member States such as France and Germany. Our research shows that nearly €8 billion have been lost for Greece – leading to further unnecessary austerity. In a desperate attempt to calm market panics in 2010, the European Central Bank announced the Securities Market Programme, or SMP. This programme was in fact a precursor to quantitative easing: it consisted in the purchase of government bonds in secondary markets. The ECB’s goal was to push down government bonds yields in order to prevent self-fulfilling market panics. Between May and June 2010, the European Central Bank purchased around 40 billion euros of Greek debt through the SMP programme. The key point however, was that at the time, those bonds were being traded into the market at 30% to 40% of their nominal value. In other words, the ECB bought a bunch of bonds for €30 knowing it would eventually receive €100 back. From there on, every time Greece repaid its public debt, the ECB accumulated some substantial profits. All profits made out of monetary policy transactions by central banks in the Eurozone are first collected by the ECB, which may retain up to 20% of profits to build its own reserves. What remains is then redistributed back to each national central bank according to its “capital key” (a percentage grossly representative of the size of each national economy). In turn, national central banks return some of the money to their respective governments. The exact amount of the profits made out of Greek bonds purchased under the SMP programme is not fully known by the public, but as we will later see, they are likely to have exceeded €13 billion. To make the matter more complex, some national central banks also made additional profits through their investments on Agreements on Net Financial Assets (ANFAs). These are portfolio investments made independently from the ECB’s SMP programme by national central banks. For example, central banks who run their own pensions funds use ANFAs. Of course like many investors, central banks have purchased Greek sovereign bonds, and therefore they also made profits in a similar fashion. While smaller, the profits made out of ANFAs on Greek bonds are around €4 billion. This is how and why some media have been reporting that member states such as Germany made money “on the back” of the Greek crisis. This fact that is obviously at odds with the narrative being promoted by the EU leaders who portrayed the Greek rescue programme as an unprecedented effort of solidarity. In 2012, there was some understanding that those profits were somehow morally undue. In a Eurogroup meeting in November 2012, finance ministers of the Eurozone reached an agreement where all member states would return the SMP profits made since 2013 to Greece. In practice, member states transferred their national profits into a segregated account managed by the European Stability Mechanism (ESM), with the exception of the profits made by the Bank of Greece which were directly transferred to the Greek government. While the idea behind the scheme was correct, the plan didn’t benefit Greece much. First, because the arrangement specifically excluded profits made before 2013 – and as we will see later, these might have been very large. Second, instead of being directly transferred back to Greece, the money had to be wired through national governments’ budgets and be specifically used by Greece to pay down its debts. This technical feature later allowed the scheme to be used as an instrument of blackmail against Greece. Hence, when tensions escalated between the Eurogroup and Greece’s finance minister Yanis Varoufakis, reimbursements were suspended. Consequently, funds that had already been transferred into the ESM account where blocked. Although the Eurogroup and Greece did eventually reach an agreement in August 2015 for a third bailout programme, the SMP refund arrangement disappeared from the Eurogroup’s negotiations – hence the profits made in 2015 and 2016 where tragically lost for Greece. The Eurogroup never provided any justifications for this decision – which obviously led to the suspicion that the move was motivated by a desire to punish Greece. It was only in May 2016 when the issue was brought back to the Eurogroup table and in May 2017 the Eurogroup finally agreed to re-activate the refunds from SMP and ANFAs profits made from 2017 and onwards. Profits made in 2015 and 2016 were however excluded. Eurogroup deal: does it all add up? The latest Eurogroup meeting held on June 22, 2018 has clarified that the Eurogroup intends to refund all future SMP and ANFAs profits from 2017 until 2022, which will be disbursed in bi-annual tranches of 600 million euros. This will amount to a total of 5.4 billion (or 4.8bn depending on one’s interpretation of the Eurogroup’s evasive statement). While the re-activation of the refunds is good news in principle, the figures presented by the Eurogroup don’t add up with the overall profits made on the back of Greece via the SMP programme and ANFAs. In the face of the appalling lack of transparency over the SMP and ANFA profits, we were nonetheless able to aggregate data from various institutions including the ECB and the IMF. According to our calculations (see table below), SMP and ANFAS have generated a profit of at least 17 billion euros for the Eurosystem – much more than the 7.8bn figure which has been circulated in the media earlier this year. This figure is likely larger as official data for 2010-2012 are not fully available to the public. As the table above shows, so far the refunds already granted to Greece plus future refunds which have been committed to by the Eurogroup amount to around 10 billion euros. Hence, as our calculations show, the last Eurogroup deal falls short of at least 7.9 billion euros of profits made from the SMP and ANFA programme. The main reason for this shortfall is that SMP/ANFAs profits made in 2011, 2012, 2015 and 2016 were either excluded from any refunding agreement, or lost as a consequence of the tensions between the Eurogroup and the Syriza government during the Spring of 2015. As it stands, Greece will not get those billions back. Adding insult to injury, future refunds are still subject to the usual compliance with policy commitments by the Greek government. In other words, the refunds could be suspended once again, if for example Greece doesn’t make enough progress on its commitments to further reforms such as privatisations. Former Finance Minister of Greece Yanis Varoufakis once said that the SMP bonds were “both a curse and a blessing” for Greece. “They were a curse because their purchases [by the ECB] had done absolutely nothing to help Greece in 2010” Varoufakis writes in his Book Adults in the Room. Furthermore, he adds: “had the ECB not bought them, that part of Greek Debt would have been written down by around 90 percent in 2012” as part of the private sector debt restructuring. Indeed, as soon as those bonds were held by the ECB, they became de facto immune from any debt restructuring because of the ECB’s reluctance to engage in anything of the sort. However Varoufakis believed those bonds could be a blessing because it gave him political leverage. By threatening to default on those SMP bonds, Varoufakis believed he could rally the ECB with him in favour of a more modest demand: swapping the SMP bonds against perpetual bonds, thereby partially writing off the debt owed to the ECB. Whether the strategy worked in Greece’s favour is not the topic of this article. However what’s for sure is that Varoufakis’s proposal for imposing a debt restructuring on those bonds made quite a lot of sense, at least from a financial and moral perspective. After all, if the Eurogroup agreed to return the profits made through the SMP programme, they might as well agree that the ECB should not make profits from those bonds in the first place, and concede a haircut. Unfortunately, it seemed the ECB was more concerned by the legal implications of debt restructuring, as opposed to its moral justifications. The argument goes that any haircut on bonds held by the ECB might be considered to be a violation of the monetary financing prohibition rule set under the Art. 123 of the European Lisbon Treaty. This is why writing off the SMP bonds never really was on the table. Instead, the ECB made sure that the SMP bonds it held in February 2012 were swapped against new bonds of the same value and terms, just to ensure they would be legally excluded from the debt restructuring (PSI) of 2012. One of the justifications for the monetary financing prohibition rule is that monetary policy should not lead to fiscal transfers across member states. However in the present case, the argument doesn’t work. Indeed, as Paul de Grauwe argued at the time, writing off the Greek SMP bonds would have not resulted in a loss for the ECB neither to transfers between member states. Meanwhile, as we saw above, the current situation certainly led to transfers from Greece to other member states “by the backdoor” – that is, throughout the distribution of the ECB’s profits. In hindsight, it is clear that restructuring those bonds at an early stage of the crisis would have been the best solution. Most importantly, such debt restructuring would have cost little to the ECB. The loss had already been absorbed by private investors when they sold the bonds to the ECB. Even thought it would obviously not solve the Greek debt crisis, Greece’s debt would be much lower had those bonds been restructured. Any cent repaid to the ECB meant more unnecessary austerity for Greece. As a first step, Positive Money Europe demands full transparency from the European Central Bank on all the profits made through SMP during the entire duration of the programme (from 2010 until the expected redemption of all bonds) and for all countries involved including Italy, Spain, Portugal and Ireland. National central banks should also disclose how much profit they made through their ANFAs transactions. Second, the ESM should centralize and disclose all this data on its website, and clarify how much of the future 600 million disbursements actually come out of SMP/ANFAs profits. Last but not least, the Eurogroup should justify why it never granted refunds of SMP profits made in 2011 and 2012, and why profits from 2015 and 2016 will not be retroactively refunded. Perhaps it is too late to rewrite the history of the Greek crisis but it isn’t too late to ensure all undue profits made on Greek bonds are given back where they belong.